A search for a stand that could display A3 posters and DL sized literature led Megabus to our D3 Poster and Brochure Displays. 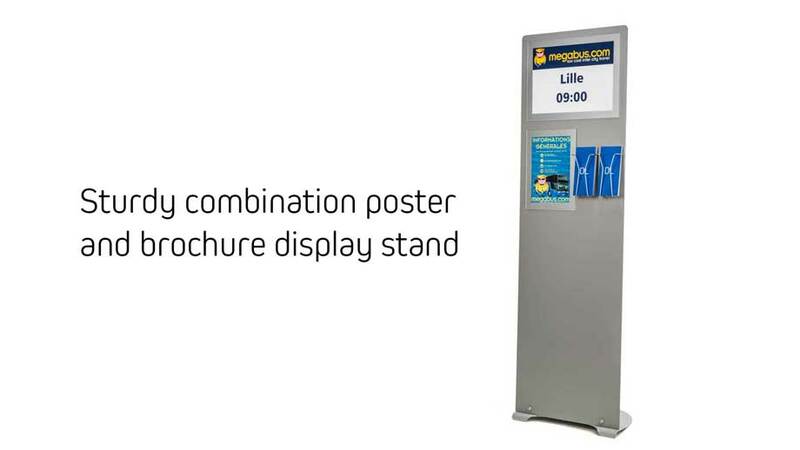 They required 10 poster brochure stand displays for their new Paris bus station where they could change the information on each bus stand quickly. Given the location of the poster brochure stand was a going to be public bus terminus, we decided to design and make a custom stand from various components we stock. We could supply a more robust display stand this way, better suited to the environment. Supplying a custom stand also meant we could configure it with the specific poster and brochure displays that Megabus required. The custom element is the vertical silver panel which hooks onto the cables from our D3 POS stand and is secured at the bottom with our standard cable fixing. This is a standard 3mm Silver Alupanel from Perspex Distribution. We radiused the corners, then drilled some holes and attached 1mm foamex panels with recessed magnets onto the panel. We then used our standard acrylic poster cover sheets to secure the A3 / A4 posters. The acrylic cover sheet attaches magnetically to the foamex panel so it can be removed quickly and easily when you want to swap your poster. The total weight of each stand is 12 kgs with the steel base being 4.5kgs. Which means its heavy enough not to get knocked over, but you can still pick it up by the masts and move it if required. We keep A4 and A5 wirework brochure holders in stock and various other configuration of this display could be designed and supplied. There is also the option to apply graphics to the bottom of the panel to brand your display permanently. Give us a call and we can prepare an illustration for you.